Green City Force’s (GCF) mission is to break the cycle of poverty, preparing urban young adults to succeed in their chosen careers by engaging them in service, training, academics and work experiences related to the clean energy economy. In doing so, GCF encourages them to lead socially and environmentally responsible lives. We are working towards a “green city” built on principles of sustainability, social, economic and environmental justice. As an AmeriCorps program, Green City Force works towards this vision through our model city-wide Clean Energy Corps in New York City. What Is a Green City Force Corps Member? Corps Members are 18-24 year olds who are currently living in NYC, are unemployed or in a dead-endjob, and have a GED or high school diploma. Corps Members have to make a full-time commitment toGCF. During their time with the program, Corps Members progress through rigorous field work and classroom study. 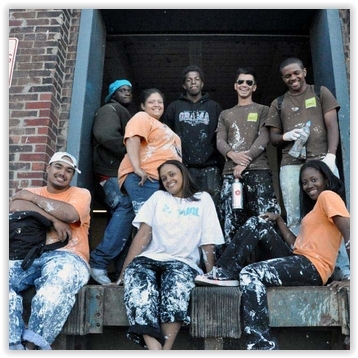 At the end of the program, GCF helps place Corps Members in a 2 or 4 year college, apprentice programs, or employment. Corps Members get authentic workplace experiences and learn from professionals who have had successful career paths in green jobs. Many of these professionals started at the same point as GCF Corps Members, a path we help our Corps Members emulate. Corps Members are overseen at all times by a Team Leader. The opportunity to develop and practice vital communication and leadership skills as part of a program that challenges participants to grow as an individuals and as team players. Corps Members are expected to take part in a supportive community where they are required to have high expectations for themselves and others. We encourage Corps Members to be visionaries about their lives and about the community and world, and we expect them to work towards turning those visions into realities. You CANNOT be enrolled in college for the Spring 2015 semester. APPLY NOW! If you meet the eligibility requirements above and are interested in our program, please call (718) 289-8100 to register to attend an Information Session.